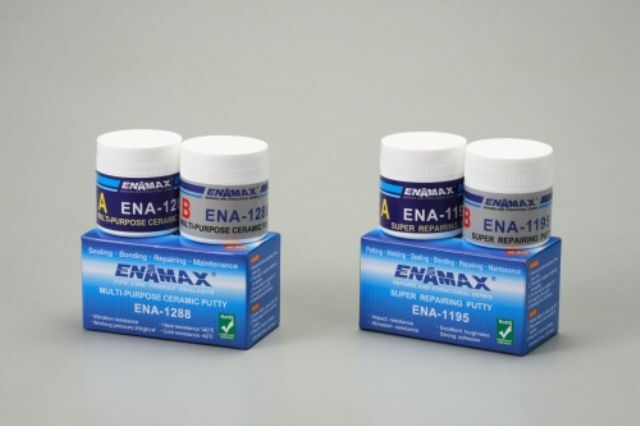 Jun 02, 2015 | By CENS | ENAMAX TECHNOLOGY CO., LTD.
ENAMAX’s ENA-1288 multi-purpose ceramic putty features strong adhesion and eco-friendly formula to be widely accepted by industrial users worldwide. Repairing cracks and leakages in metallic and nonmetallic materials as piping by welding typically calls for formally-trained, certified personnel at higher cost in wages and equipment, and also involves time-consuming, hazardous work that results in pollution, as well as potential damage to original material via poor workmanship and compromised material quality, integrity due to incompatible welds. To help engineers, tradesmen overcome such a problem when repairing metal parts and piping in safe, efficient, environmentally-friendly way, ENAMAX Technology Co., Ltd., a developer and manufacturer of industrial sealants in Taiwan, promotes the ENA-1288 multi-purpose ceramic putty noted for eco-friendly formula and strong adhesion. The ceramic putty is made with a special formula without heavy metal particles, organic bromine compounds and other toxic substances. Accordingly, this product measures up to the requirements of 2002/95EC RoHS (as tested by SGS and documented in the report CE/2010/B4232). A key feature of this ceramic putty is excellent adhesion, coupled with versatility to make this product very useful as sealant and adhesive. This product can be applied to valves, pipes and other parts of various materials, including rigid PVC plastic, metals and ceramic. Once spread over cracks or leaking holes, the putty hardens naturally within 1-1.5 hours under normal room temperature, with its ceramic content enabling curing into a super-hard sealant to firmly adhere to surfaces of any direction without need for clamping or jigs. The putty is also a strong adhesive, being resistant to oxidation, and particularly thermal expansion and contraction, as well as shock, bending, FREON, acidity, alkalinity and corrosion. The ceramic putty comes in several optional packaging for wholesale and retail, and can be used with ENAMAX ENA-1365 and ENA-1366 fiberglass-reinforced belt for enhanced anti-leakage effect, with a shelf life of 3 years under room temperature of 25℃. With outstanding quality and long shelf-life coupled with a 5-year quality guarantee, this product is widely recognized by professionals as an efficient, economical and eco-friendly alternative to welding for repairing defects and cracks on metal and ceramic parts and pipes, being extensively used in electronic, semiconductor, optoelectronic, petrochemical, machinery, pipe fitting, air conditioner, hardware and bathroom fitting industries. Aspiring to provide the best industrial sealants and adhesives using Nano technology, ENAMAX, founded in 2006 in Taiwan's central city of Taichung, has built a distinct profile as a specialized supplier in this sector across the global market within only a couple of years. With leading production techniques and extensive know-how of sealant formulation, this company capably turns out not just the ENA-1288 multi-purpose ceramic putty, but also ENAMAX® Hot Melt Welding Adhesive, Deluxe Ceramic Repair Putty, Super Duct Aluminum Adhesive, Super Thread Sealant, all of which are remarkable for quality, high adhesion, flexibility and meeting RoHS requirements. The company's products are marketed under its brand “ENAMAX,” and proven popular with professional users all over the world.